One of the most popular posts on PPC Ian is my Blog Commenting Strategy. I’m a huge fan of blog commentating for a variety of reasons. First and foremost, it’s fun! It’s great to be part of the conversation. Second, it’s a great source of traffic. 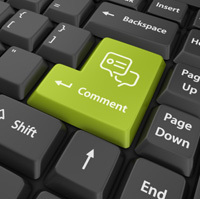 Write an insightful comment and you will quickly gain new readers. Third, blog commentating can be a great source of SEO-optimized dofollow links. 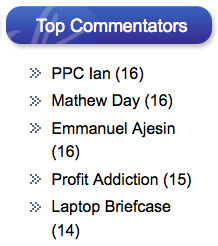 That is, if the blog you comment on has a top commentators widget (like the one I have here on PPC Ian in my footer). I used to do a ton of commentating. I originally purchased my iPad so I could commentate on the go. I would write comments on the train to and from work. I would bring my iPad to lunch and would write comments during my meal. I would even commentate on my mobile phone while away from my computer. I got a little bit obsessed. These days, I’m still commentating but not quite as much. Why? Many of the big bloggers such as John Chow and Jonathan Volk have done site redesigns and have removed their top commentators widgets. I used to comment on these blogs multiple times per day because I got my name in the top commentators lists. This gave me thousands of dofollow inbound links, from blogs closely related to mine by topic. Don’t get me wrong, I’m still a huge fan of both of these fine blogs, it’s just that I don’t comment quite as much since there is less of a reward. 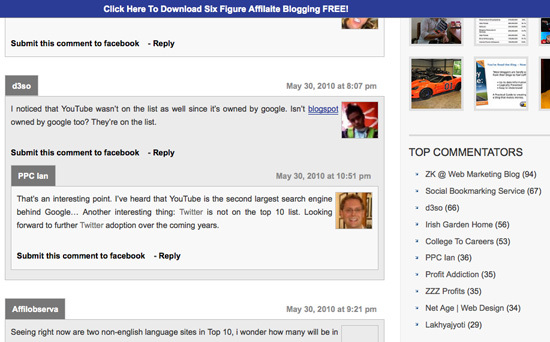 So, you may be wondering, why are these big bloggers removing their top commentators widgets? If I had to guess, it probably comes down to preserving link juice (5-10 outbound links on each page of your blog can add up). It probably also comes down to comment quality. When you have as top commentators widget, the comments can sometimes be of lower quality. I particularly saw this happening on John Chow’s blog, although not anymore now that the widget has been removed. As a blog owner, I’m a huge fan of having the top commentators widget. In addition to my top commentators widget, I even ran a Blog Commenting Contest. I feel passionately about rewarding those readers who support my blog by commenting. It takes time to write comments and I do my best to reward those supporting my blog. The moral of the story: My blog commenting strategy is still very viable, but it’s more difficult finding blogs with top commentators lists. They still do exist, however, and I highly recommend seeking them out. You can even search on Google for directories of blogs that have dofollow top commentators lists. Moreover, don’t give up on blogs without top commentators. You may wish to throttle back your comments, but I still write many comments to this day on blogs without the widget. So I’m a huge fan of blog commenting. As a result, I decided to run a blog commenting contest. The contest was extremely successful and I announced the winners a few days ago. Today, I’m super excited to review the three winners: Profit Addiction, Dino Vedo, and My 4 Hour Work Week! I’m going to start out by reviewing Profit Addiction, the winner of my contest with an astounding 48 comments in just two short weeks! It’s no surprise that Profit Addiction won because my blog commenting strategy was originally inspired by this blog. Jeremy, the owner of Profit Addiction, is a blog commenting king. His comments started showing up everywhere and I certainly took notice. I’m really happy to see Profit Addiction win my contest because I have been a long time fan and commentor on this blog. Jeremy’s tag line really says it all: "When revenue is not enough". I always hear about both affiliates and companies making a lot of money. However, a lot of the time, these people are talking about revenue and not dollar margin (also known as profit). Jeremy gets it right: It’s all about profit and revenue isn’t enough. So why am I such a fan of Jeremy’s blog? Easy! 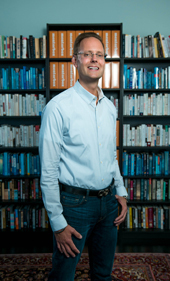 Profit Addiction offers amazing case studies where he really goes into detail. Many blogs these days focus on the high level. Just think about it: If you had a winning strategy, would you share it? Not everyone would, and that’s ok! Profit Addiction, however, takes a very different approach. 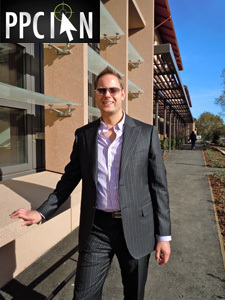 Jeremy goes into amazing detail about his personal online marketing tests. One of the other reasons I like Profit Addiction: Jeremy really gets it when it comes to the high level attitude and strategy stuff. PPC Ian is all about corporate PPC. Interestingly, while Profit Addiction is more of an affiliate marketing blog, many of Jeremy’s posts really hit home when it comes to the corporate world. Some of my favorites: What’s Your Strategy? and Numbers Don’t Lie. I strongly encourage you to visit Profit Addiction, you won’t be disappointed! Dino Vedo, the runner up in my blog commenting contest, delivered a very respectful 26 comments! Just like Profit Addiction, Dino Vedo sports an awesome tag line: "A Young Entrepreneur Turned Millionaire". Now, if I’m trying to learn about online marketing, who am I going to listen to? Well, a millionaire certainly sounds like a great starting point! Just like Jeremy from Profit Addiction, I have seen Dino Vedo commenting all over the Internet. For that reason alone, he gets instant points in my book. Dino obviously knows what it takes to build relationships in the online marketing community to drive volume to his blog. Recently, Dino Vedo has been updating his blog every single day, something else I respect and even envy. As a blogger, I know that involves a ton of work. Dino Vedo, awesome work on both your blog and your comments on my blog! Everyone, make sure to check out Dino Vedo’s blog! I’m a huge fan of passive income. I love dividend-paying stocks. I love dividend-paying websites (also known as affiliate marketing). Robert Kiyosaki is my hero and I’m also a huge fan of the 4-Hour Workweek book by Timothy Ferriss. As such, I immediately became a fan of My 4 Hour Work Week, the third place winner with a solid 9 comments! As the name implies, this site is all about building your optimal lifestyle, one filled with unlimited options. How do you have so many options, you may ask? Easy: Passive income! This blog is not associated with the official book. Rather, it’s run by Eric, a CPA at a big accounting firm. Eric discusses his personal quest to build passive income in his spare time. One of my favorite posts: Passive Income Experiments. Whether you’re new to passive income or an old time fan, I highly encourage checking out Eric’s blog. I respect Eric very much and feel like his ambition is very relatable. In other words, it’s hard these days to find someone who is not trying to build at least a little passive income and financial freedom (via the Internet and other means) in their spare time. Make sure to follow Eric and his exciting journey! Eric, thanks for your insightful comments and congratulations! Want recommendations on even more quality blogs about online marketing? You may wish to check out my favorite online marketing blogs. Today is the day you all have been waiting for: I’m about to announce the winners of PPC Ian’s first ever blog commenting contest! 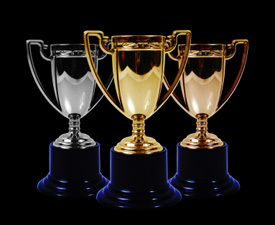 The contest was a huge success with the top three commentors generating 83 insightful comments. That’s quite amazing considering my blog has a grand total of 351 comments since its launch in October, 2009 (including my own comments as well)! In just two short weeks, I was able to leverage a simple contest to rapidly accelerate my comments and take my user engagement to the next level. The takeaway: A blog commenting contest is a great way to drive your blog to the next level. Why did I run this contest? It’s simple: Comments are the most interesting part of blog posts (at least in my opinion). Posts without comments simply aren’t as interesting. Moreover, comments tell both humans and search engines that your blog is good and worthy of traffic. If it weren’t interesting, there wouldn’t be any exciting comments. 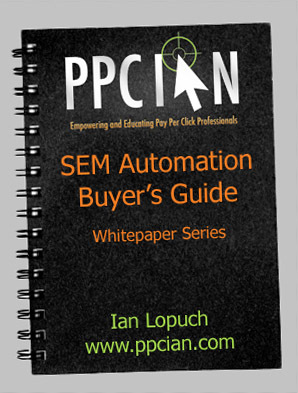 In short, I ran the content to increase user engagement while drawing in new PPC Ian readers. It definitely worked! You may recall that I linked to 10 posts in the contest that previously had 0 comments. I’m now pleased to announce that all of these posts have comments. Excitingly, my post about leverage and my post about eBay’s quality click pricing each have 10 comments now! Jeremy, Dino, and Eric, I sincerely thank you for your comments! I learned a huge amount from your insightful comments and questions. It’s really quite funny: Jeremy from Profit Addiction originally inspired my blog commenting strategy. This strategy received a ton of interest, became one of the most popular posts on my blog, and even got featured on Jonathan Volk’s Week In Review. My blog commenting strategy in turn inspired my blog commenting contest. Coming full circle, it’s absolutely no surprise at all that Jeremy won the competition, he inspired my original strategy after all. PPC Ian has really been taking off thanks to all of you. Because my blog has been ramping so quickly, I wanted to take some time today to share some of my favorite PPC Ian posts from the past while also introducing PPC Ian’s very first contest! If you scroll down a bit and look at my blog’s right sidebar, you can see my favorite posts. I highly recommend checking them all out. You’ll notice that all of these posts have lots of comments. Today, however, I’d like to take a different approach and share my top 10 favorite posts that got 0 comments. These are posts that may have been missed because they’re a bit older, before my blog started getting a lot of traffic. First, however, I’d like to talk about my contest! I’m a huge fan of blog commenting. As highlighted in my last post about SMX Advanced, I just met up with the Unique Blog Designs team. I’m actually working with these guys right now to make some enhancements to PPC Ian! One of those enhancements is an awesome top commentors section where I link to those of you driving the comments on my blog. I can’t wait! However, we’re just in the planning phase now (there will be a whole bunch of items on the checklist) and this process could take a bit of time. As such, I started brainstorming ideas on how I could drive more comments on PPC Ian now and an idea was born: Run a contest to drive blog comments! So here’s the deal: Starting right now, this exact moment, I’m going to run a two week contest. This contest will reward the top three commentors over the next two weeks with reviews of their blogs (or websites). 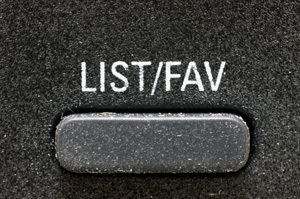 The reviews will feature each winner’s site with deep links to the top features on their sites. This is an awesome opportunity to get free press (and links) to your site! Every comment that you make between now and two weeks from this exact moment will count towards a comment in the contest. I highly encourage commenting on the 10 awesome online marketing posts featured below for the simple fact that they have 0 comments right now. I would love to get your opinion on these posts. These posts are hidden gems on this blog in my opinion. At the same time, please do feel free to comment on any posts you’d like – all comments count. Two weeks from today, I will tally up the comments by commentor. The top three commentors will be featured in a follow-up article. That article will review the blogs (or websites) of the top three commentors and will provide several links to each site! The only restriction: To be eligible for this contest, your blog (or website) must be "family friendly." There you have it! I’m excited about this contest and looking forward to reading everyone’s comments! Following are some of my favorite PPC Ian posts. All of these posts received 0 comments. Even so, I feel like these posts are true hidden gems! I posted them before my site started getting a lot of traffic and I sincerely feel that you’ll learn some great stuff from these posts. I’ve divided them up into four broad themes: Search Marketing Career Tips, SEM People Management, Domaining, and Affiliate Marketing. I’m looking forward to reading your comments! 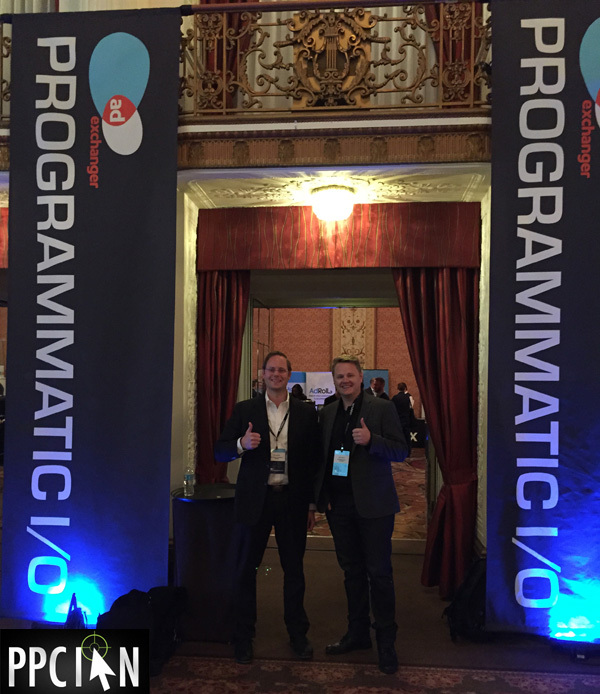 In my opinion, it’s all about PPC. At the same time, you can be even better at PPC if you learn other marketing opportunities and channels as well. Just last week I wrote all about offline marketing and specifically the WebEx Caltrain Station Takeover. Today, I’m excited to share one of my new blog marketing strategies: blog commenting. I launched PPC Ian, my first blog ever, back in October, 2009 and it has been an amazing learning experience for sure. My marketing strategy originally revolved around my extensive network of friends on Facebook, Twitter, and LinkedIn. 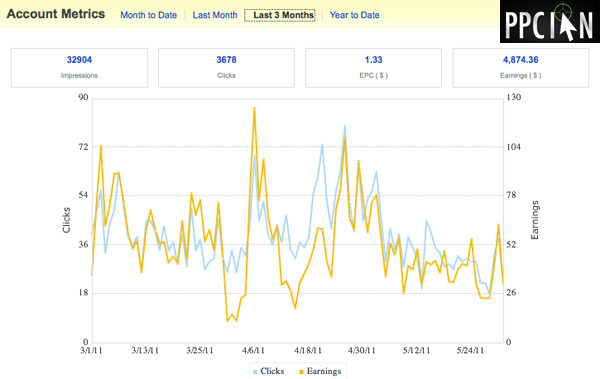 As the months passed, my strategy shifted to an SEO and PR one with a little PPC mixed in. My traffic stats are now at an all time high thanks to loyal readers like you! However, I’m an ambitious guy and definitely want to grow my traffic quite a bit more. Moreover, realizing that blog marketing requires a whole different skill set than my portfolio of static websites, I’m now experimenting with some new marketing strategies including blog commenting. Why Am I Commenting On Blogs? There are many reasons I decided to start commenting on other blogs with the following topping the list. First, I noticed my friend Jeremy from Profit Addiction commenting everywhere! In tandem, I noticed Jeremy’s traffic and comments on his blog spiking. Blog commenting seems to be a strategy working quite well for Profit Addiction so this definitely piqued my interest in running my blog commenting test. Second, I realized that blogging is a very social phenomenon. It’s all about conversation. If you don’t participate in the conversation, you’re not going to get as much attention. I realized how important it is for me to join the conversation. This is a very different philosophy that the one I’ve historically leveraged with my portfolio of SEO websites and one of the key differences between a blog and static website, in my opinion. Third, I realized that blog commenting is a great way to get quality inbound links to my blog. Many of the great blogs out there have a top commentors list in their sidebar or footer (meaning the list shows up on every single page of these blogs). Moreover, many of these top commentors lists are real links. Unlike links in the actual comments you make, the top commentors links do not contain nofollow tags so search engines respect these as legit links! Fourth, and most importantly, it’s just plain fun! I’m commenting on other blogs because I very much enjoy it. There are a number of amazing blogs out there about online marketing and it’s fun to join the conversation. There are two images in this article. The first shows me as the number one top commentor on Jonathan Volk’s Blog. I’m a long time fan of JV and enjoy his blog quite a bit. If you’ve been reading my blog for a while, you may know that JV interviewed me a while back. I can always count on JV for quality posts and enjoy interacting with others on his blog. Moreover, his top commentors list gives me that great inbound link I was just discussing. I’m currently reading JV’s new eBook about Facebook advertising and hope to review it here in the coming week or so. The image below shows one of my comments and also shows that I’m a top commentor on JohnChow.com. In the world of online marketing, JohnChow.com is a man who needs no introduction. I actually just reviewed John Chow’s Book and was also reviewed on John’s blog a while back. Like JV’s top commentor’s list, John’s also provides a quality inbound link. Want to learn about more of the blogs which I frequently comment on? Make sure to check out my blogroll and also my post from a while back about PPC Ian’s favorite online marketing blogs. While my experiment is still in progress, I wanted to leave you with a few interesting closing thoughts. First, I must say that commenting requires time! Not too much for me at this point, but the commitment is definitely there. Longer term, I may decide to outsource some of the work if I further build out this strategy. Second, I am already seeing some results. I’m getting direct traffic by participating in the discussions out there about online marketing. At the end of the day, that was my goal so I’m thrilled. Third and most importantly, I wanted to call out the great fact that I’m learning. If you’re in the corporate PPC world like me, you’re probably laser focused on PPC all day long. That focus is a good thing because it creates a guru level mastery of PPC. At the same time, it leaves little room to learn other stuff. Most of my personal knowledge of SEO, email marketing, and now blogging has been self-taught. If you’re in the corporate world of online marketing, I highly recommend dabbling in a few side projects such as blogging. Your knowledge will skyrocket and will start paying dividends in your corporate career.